Several elements of SmartDwelling I, published recently in the Wall Street Journal’s Green House of the Future article, are highly visible. Two of the more important ones, however, can”t be seen at all... at least from the ground. See the grey roof just to the left of the Tower of Wind & Water? 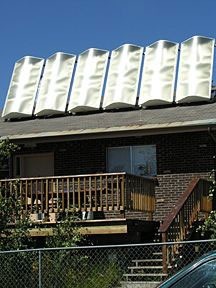 Those are the hot water solar collectors that provide hot water to the entire house. See the blue roof covering the two-story porch? Those are photovoltaic collectors that provide electricity to SmartDwelling I. Both sets of collectors are on low-slope roofs, so there’s no way you can see them unless you’re a long way from the house. They also occupy the entire roof... in essence, they are the roof. This means that even if you’re far enough back from the house to see the roof surface, you’re still unlikely to notice anything different. I tried this approach first on a design for a Green Shed at Southlands, a DPZ project near Vancouver. Southlands is a place where all of the people living there will be able to get all the food they need from food grown on the property. Contrast this with normal collectors which are usually designed for the perfect angle of maximum solar efficiency, no matter how hideous that makes them look on the roof. 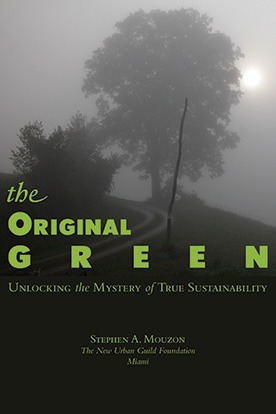 This attitude of getting the engineering exactly right with not a thought for design likely contributed to the demise of the first green revolution that began in the late 1960s and died in the early 1980s. Read this post to find out why. I am always bothered by the aesthetics of solar panels because they always sit on top of the roof and are never THE roof, and they are always rectangular so that they never work on hipped roofs. Finally, I wish someone would design and manufacture a solar panel that works in ambient light and doesn't have to face south. 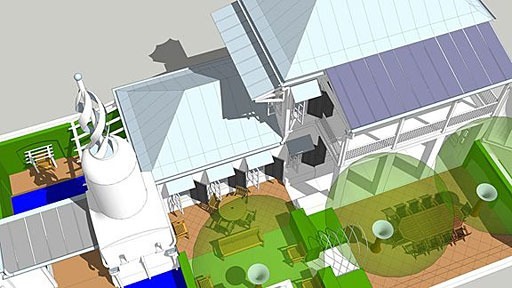 I would like to see an entire hipped roof of solar panels that would operate on different levels of efficiency depending on the angle of the sun; even panels facing north would still get some sunlight and may not work as efficiently as the south facing panels, but at least the result would be a more unified looking roof. One issue that needs to be resolved is how roofers and electricians can coordinate their efforts with one another. There are photovoltaic panels systems on the market now that are integrated with metal roof panels. I believe they can be cut to shape if the roof isn't rectangular, though throwing away part of an integrated photovoltaic panel is a lot more expensive than just throwing out par of a metal roof panel. Your hope that solar panels can face north is, unfortunately not workable. The amount of incident light on the sun-facing slope of a roof will be hundreds of times more than on a shaded or north facing slope and so would the amount of power generated. This is a case where aesthetics and physics are at odds. Physics wins. I do think that an unnecessary insistence on absolute "correct" orientation for solar collectors was a factor in their lack of acceptance in the past. Collectors oriented within 20 degrees of south and within about 30 degrees of vertical angle from the latitude of the site produce about 90% of the energy of the "perfect" orientation. It's well worth accommodating the aesthetics for a slight loss in efficiency, but if you just ask the engineer he'll lobby for perfection. 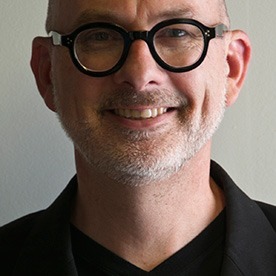 The primary factor against wide acceptance has always been cost. I've seen an early 20th C. photo of Pasadena CA that shows many of the rooftops with really hideous primitive solar hot water collectors. Fuel was expensive in CA then. As soon as the cost of oil cane down, the collectors disappeared. Ugly AND expensive is really unacceptable.